This is a Special Report from the desk of a Jurassic Park superfan. Jurassic World (Colin Trevorrow, 2015) is a product of its time. And by that, I mean our time. The age of bloated superhero epics that tell the same origin stories over and over—even when they’re all gathered together to “save” the world again. Because what could be better than having one superhero in a movie? Six of them, that’s what. It’s also the age of flying cars in straightforward action pics, not science fiction fantasies set in the near-to-distant future. Because how could a stunt involving cars rushing through a tower be more awesome? If it blasts through two towers! If audiences were clamoring for bigger, meaner dinosaurs to rampage through the park, ripping people to shreds or eating them whole, then Jurassic World doesn’t disappoint. 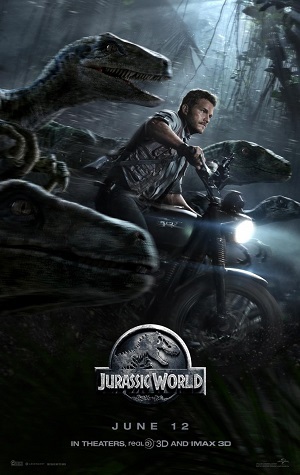 (And apparently this is exactly what the spectators wished for; Jurassic World has raked in over $524.4 million worldwide during its opening weekend alone, becoming the largest opening weekend ever.) It is big, loud, and out of control. It is Jurassic Park on steroids, and I can’t imagine that anyone is comparing the reboot of the franchise favorably to Steven Spielberg’s 1993 classic. Jurassic World, unlike its predecessor, is deeply mired in cynicism and devoid of any sense of wonder. It is horrifically violent but not at all scary. Jurassic Park is a cautionary tale about what you should not wish for. Jurassic World is a war movie. This essay is littered with spoilers, so keep out if you want to stay safe! The most interesting aspect of Jurassic World is its cynical commentary on today’s movies. But first, some back story: the protagonist, Claire Dearing (Bryce Dallas Howard), is the top executive of the Central American theme park situated on Isla Nublar (the same island off the coast of Costa Rica that once housed John Hammond’s Jurassic Park), and she spends much of her day trying to woo corporate sponsorships for new park attractions. When we first meet her, she is on her way to securing an endorsement from Verizon Wireless. But what is it for? In order to attract more new and repeat visitors, Dr. Henry Wu (BD Wong, the only actor returning from any of the original three films) and his team of InGen lab scientists have engineered a brand-new dinosaur, Indominus rex, whose full genetic makeup is classified information. 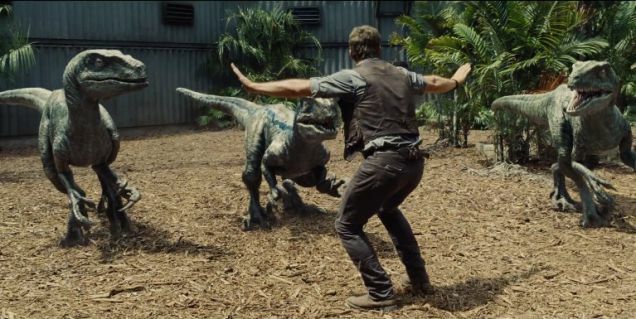 When the beast inevitably escapes its containment barrack by tricking the computer-controlled thermal sensors and guardsmen into believing that the dinosaur has clawed its way out, it is a good thing that raptor whisperer trainer Owen Grady (Chris Pratt) is on hand to help Claire contain the escalating situation. A former Navy man, it is unclear how Owen has wound up on the island, and he is incredulous as to why simply having living, breathing dinosaurs on display isn’t enough for Jurassic World’s owner, the oil and telecommunications tycoon Simon Masrani (Irrfan Khan). Why would he condone creating an animal no one knows or understands, Owen wonders. Claire tells Owen that people—nay, focus groups—have expressed renewed interest in the park if Jurassic World can produce a bigger, meaner dinosaur, something they haven’t seen before, thereby echoing the movie studios’ persistence to churn out mind-numbing entertainments with high but unremarked upon body counts and copious stunts and explosions. A typical view of Indominus rex, right into its mouth. Image courtesy of Universal Pictures. The problem is that Indominus rex (whose ridiculous name, Claire insists, is supposed to be easy for people to pronounce) is too familiar to be genuinely awe-inspiring. Director Steven Spielberg and his team waited more than at least thirty minutes to show the Tyrannosaurus rex in Jurassic Park, figuring its appearance was all the more shocking because, like his Jaws (1975) before it, the weight and menace of the so-called “King of All Dinosaurs” had been sensed and all but completely understood by characters and film viewers alike until that crucial set-piece. Indominus rex appears much earlier in the new film, and to give credit where credit is due, it is so big that it hardly fits in most frames. Part T. rex, part tree frog, and part Velociraptor among other unnamed species, Indominus rex mostly resembles the “tyrant lizard” with the shape of its head and its short arms (although it does not always move upright through space). The creature’s long, bumpy back recalls that of Godzilla, and its pinkish gray flesh reminded me of The Blob (Chuck Russell, 1988), only less like Pepto-Bismol. When he sees Indominus rex for the first time, Masrani is stunned at what he calls its “white” skin. Claire senses his disapproval, but he insists that he loves it. Unfortunately, the designer dino isn’t easy to spot amongst all of the green vegetation in the park and eventually rips the under-the-skin homing device out of its flesh. Alpha and Beta raptors Owen and Blue. Image courtesy of Universal Pictures. Jurassic Park’s skeletal recreation welcomed visitors to explore the past; Jurassic World patrons can glimpse the future. Image courtesy of Universal Pictures. 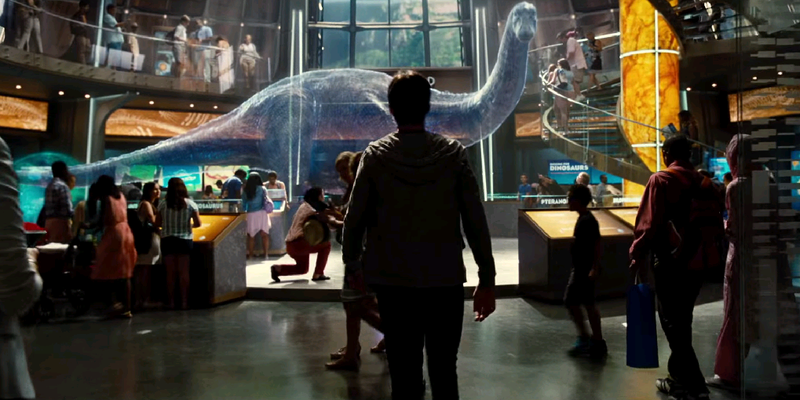 Establishing shots of Jurassic World’s attractions demonstrate how marginalized paleontology, scientific inquiry, and even history have become. Inside the Visitors Center, a hologram of dinosaurs takes center stage, replacing the full skeletal reconstruction of the T. rex from Jurassic Park. Off to the side, children play in what is effectively a sandbox, pretending to unearth dinosaur bones. Even the crackpot science of the 1993 film is only referenced in an updated interactive computer screen showcasing Mr. DNA (the cartoon narrator of the behind-the-scenes lab tour in Jurassic Park) or in the massive amber-laden design of the shops at the park’s entrance. Just as he feared, Dr. Grant and his kind have been forced into extinction. Those are some oversized raptors, for sure. Image courtesy of Universal Pictures. For fans of the original based on Michael Crichton’s 1990 novel of the same name, it is easy to recognize that the raptors still sound the same (like geese) in Jurassic World, that they’re still featherless and too big according to the fossil record. The distinctive font for the movie and park logo (what is it called anyway, “Jurassic Park?”) is the same, only it is now Terminator steel in color, highlighting its militaristic narrative that I will come to later. In keeping with early twenty-first century trends to be more environmentally conscious and sustainable, it’s comforting to know that the gates to Jurassic World contain repurposed wood from those of Jurassic Park. Upon entering the control room for the first time, Claire chastises computer security expert Lowery (Jake Johnson, the only source of comedy in the whole picture) to clean up his workstation littered with small dino figurines in much the same way that John Hammond (Sir Richard Attenborough) called out Dennis Nedry (Wayne Knight) for his slovenliness in Jurassic Park. The narrative conduit through which Jurassic World raises the emotional stakes also concerns the top executive’s relatives. While their parents hash out the details of their divorce, brothers Zach (Nick Robinson) and Gray (Ty Simpkins) travel to the tropical paradise to be reunited with their aunt, Claire, after seven years or so apart. She is too successful and busy to show them around personally, and so Claire assigns her assistant Zara (Katie McGrath) to look after the boys—before they ditch her in a crowd and subsequently go off-road in the park, to their peril. 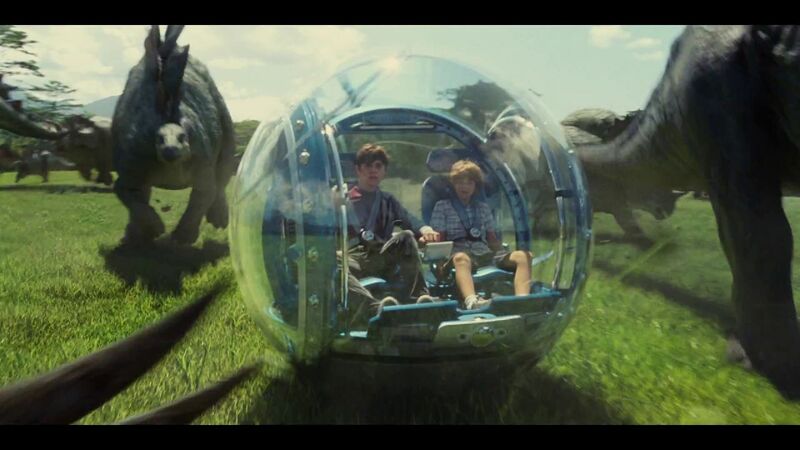 Unlike Tim (Joseph Mazello) and Lex (Ariana Richards), John Hammond’s grandchildren who survived a vicious T. rex attack, electrocution by high voltage cables, and a group of raptors’ stealthy predation in Jurassic Park, the moody teenager Zach and his dorky dino-loving younger brother Gray are passive, ill-developed characters. In this day and age, it seems both outdated and highly implausible that parents would even attempt to keep their divorce secret from their teen and pre-teen children. Keeping the boys’ parents off the island until the whole family finally reunites after the big, bad dinosaur has been vanquished oversimplifies the narrative and likely keeps production costs low, as if that is a real concern (the producers of Jurassic World undoubtedly followed Hammond’s maxim to spare no expense). To add insult to injury, the script’s old-fashioned sexist gender politics actually calls for the boys’ mother Karen (Judy Greer, wasted), when accused of sounding like her mother, to point out to her sister Claire that she’ll understand how right their mother was when Claire has her own children. Claire corrects her with, “If I have children.” Karen settles their dispute with, “When.” During this exchange, I leaned over to whisper to my sister that the four screenwriters can’t write dialogue between two women, let alone sisters. Why is Karen/the filmmakers so intent on defining Claire in terms of her willingness and ability to mother children? Watch where you step, Claire! You might break a heel. Image courtesy of Universal Pictures. In fact, much has been made of Jurassic World’s representation of women, much of it centered on Claire’s outrageous superhuman ability to outrun dinosaurs in high heels. In her New York Times review, film critic Manohla Dargis laments that Claire “mostly just schemes and screams, before Owen melts her like an ice cube on a hot griddle.” More like a Megan Fox character in any of the Transformers movies, with her permanent sheen of attractive sweat, Claire is a far cry from the intelligent, heroic paleo-botanist Dr. Ellie Sattler (Laura Dern). Those are some tough shoes to fill: Ellie wasn’t afraid to stick her hands into mounds of dino dung or call out Hammond’s sexism in Jurassic Park. More troublesome than Claire and Owen’s romantic subplot, which Joss Whedon deemed “70’s era sexist” once a clip from the film was released online over two months ago, is how Jurassic World tortures another female character. Sure, Zara may not be that interested in keeping an eye on Claire’s nephews—she’s too attached to her phone and likely believes babysitting is beneath her (is she wrong? )—but does she deserve to die such a violent and traumatic death? About midway through the film, amateur helicopter pilot Masrani fatally crashes into the aviary, thereby inadvertently releasing swarms of Pteranodon and Dimorphodon into the park and allowing them attack visitors. Two or more play a game, passing Zara back and forth before one drops her in the pool of the gigantic Mosasaurus. This act seals her fate to wind up as an even smaller bite-size snack than the shark from Jaws, a feeding demonstration that memorably plays out like a Shamu show at Sea World in the Jurassic World trailer. The Mosasaurus eats Jaws; it’s never safe to go in that water. Image courtesy of Universal Pictures. But Jaws isn’t the only piece of film history gobbled up in Jurassic World. As part and parcel of the film’s commentary on the outlandish and out-sized spectacle of today’s movie entertainments, Jurassic World also deconstructs its studio’s theme park attractions. Literally. Jimmy Fallon, the star of NBC’s The Tonight Show, makes a cameo appearance as the host of the Gyrosphere off-road experience, thereby reprising his role as the video guide of Universal Studios Hollywood’s Studio Tour. His comic hijinks shot in a studio laboratory and broadcast on the re-envisioned tram’s video screen turn glitchy once Indominus rex attacks Zach and Gray in their Gyrosphere vehicle. Contrary to Fallon’s claims, indestructible this technology is not. This is also how the only truly awe-inspiring sequence in the entire film concludes, with a callback to the T. rex’s attack on Tim and Lex’s electric-powered Jeep. Zach and Gray’s safari adventure, rolling around with stampedes of Apatosaurus, Parasaurolophus, Stegosaurus, Triceratops, and others, recalls the moment in Jurassic Park where Drs. Alan Grant, Ellie Sattler, and Ian Malcolm (Jeff Goldblum) see the Brachiosaurus for the first time. But the Jurassic World sequence is heavily edited and too closely framed. The sense of wonder so prevalent in Jurassic Park (look! living, breathing dinosaurs!) is completely absent in Jurassic World, and composer Michael Giacchino’s reworking of John Williams’s iconic score even fails to move. It just doesn’t feel earned. Zach and Gray, just a couple of kids. And some dinosaurs! Image courtesy of Universal Pictures. Universal puts more of its properties through the ringer, as well. Whereas the more natural landscape of Jurassic Park was sparsely populated with brutalist concrete buildings, Jurassic World strikingly resembles Universal City Walk by way of Disney’s Animal Kingdom. Its Disneyland-like Main Street U.S.A. is lined with shops that anyone would recognize from a standard suburban American mall: Starbucks, Jamba Juice, Pandora, etc. Other than visiting to look at dinosaurs, there is nothing special about this place. The only mention of what I would consider an extraordinary experience on offer at “Downtown Jurassic World” is the quick advertisement on the loudspeaker for a Chilean sea bass dining experience, which references a lunchtime meal in Jurassic Park that no one actually partakes. They’re all too busy discussing whether or not Jurassic Park should exist. There is no such philosophical reflection in Jurassic World. 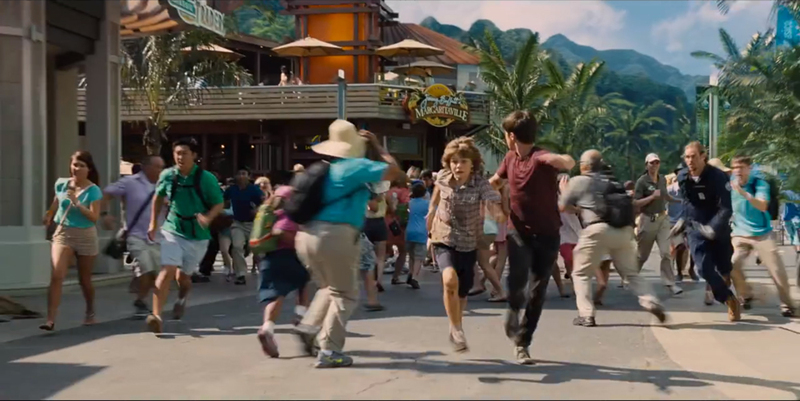 Main Street of Jurassic World under attack. Maybe opening a franchise of Jimmy Buffett’s Margaritaville restaurants on Isla Nublar wasn’t such a good idea, after all. Image courtesy of Universal Pictures. Given what I’ve read about Michael Crichton’s literary oeuvre and his political ideology, I imagine that he would gleefully applaud the rampaging dinosaurs’ destruction of this tasteless, highly corporatized place. In its pursuit of dollars and sponsorships, the telecommunications conglomerate that owns Jurassic World (remember, Comcast owns Universal), brings about the end of civilization—the wild animals in the zoo, particularly the little-understood hybrid—fight back! (Control is an illusion, or so said Dr. Ellie Sattler.) The rampant commercialism and excessive consumption on display throughout Jurassic World gets it most exacting and seemingly innocuous indictment not in the very unsubtle product placements strewn throughout (featuring the likes of Mercedes, The IMAX Experience, and Samsung) but in various characters’ drinking soda from oversized Jurassic World paper cups. As such, those film spectators in the theater sipping Coke or shoveling popcorn into their mouths from Jurassic World tie-in merchandise containers are somewhat implicated in Jurassic World’s expensive socio-biological experiment in entertainment gone so horrible wrong. After all, the next best thing to actually being there is feeling immersed in the park’s material culture. The movie’s website outwardly projects a real-life presence for Jurassic World, giving weather forecasts and “real-time” approximations for various attractions’ wait times. Visitors can even refill their souvenir cups for only 99 cents at filling stations throughout the park. The spell is broken, however, once you click “Get Tickets” and you’re rerouted to a Fandango-like website listing movie times in your vicinity. Contrary to what Claire believes, Lowery, a lifelong Jurassic Park supergeek, doesn’t wear his t-shirt ironically. Image courtesy of Universal Pictures. As a Jurassic Park superfan, I admit that I would love to own a t-shirt from the movie (and by that, I am referring to shirts that were featured in Jurassic Park and were subsequently available for purchase in the real world). 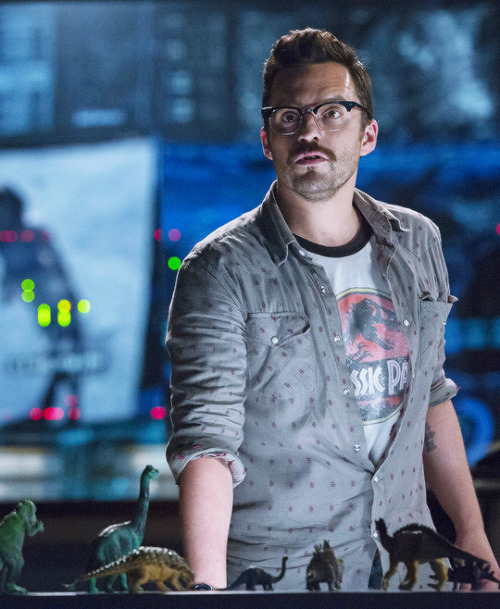 Jurassic World blurs this line between diegetic and real-world marketing when Claire reprimands computer security expert Lowery for wearing an original Jurassic Park tee, labeling it in poor taste to promote a park where people lost their lives. She therefore negatively judges people’s continued morbid fascination with Jurassic Park. He beams that this collector’s item only set him back $150 on eBay, a steal when they usually go for $300. Of course, this line from Claire comes across as highly hypocritical: is she not profiting now from the disaster of Jurassic Park? As for Lowery, my sister doesn’t understand why a dino-loving guy who ironically wears a Jurassic Park tee would work there, either. My only guess is that he represents the Jurassic Park aficionado that so many of us are and that he wants to prevent a similar disaster from ever happening again. But too bad. He can’t. 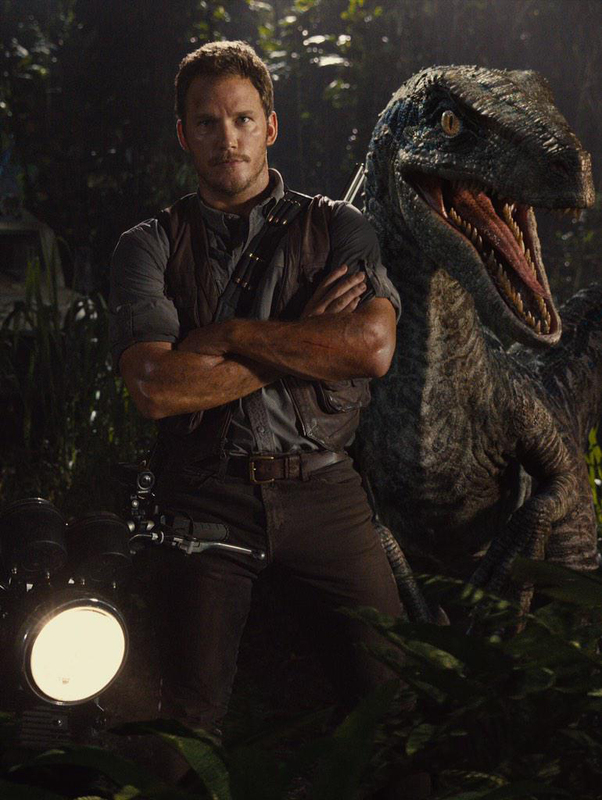 Of course, what brings Jurassic World personnel to its knees is another inside job. Whereas computer programmer Dennis Nedry wreaked havoc in Jurassic Park when he shut down the power in order to get away with a canister of dinosaur DNA for personal profit, Dr. Henry Wu and a U.S. military contractor named Hoskins (Vincent D’Onofrio) scheme behind Masrani and Claire’s backs to design Indominus rex with technological advancements that make it imperceptible by all known combat weapons currently used in the field, including thermal sensors and drone radars. In other words, disaster was bound to strike Jurassic World because Wu and Hoskins engineered it just so. As I stated before, when we meet Owen, alpha papa to a gaggle of raptors, it is unclear as to what he wants to achieve with the trained predators who were arguably the principal villains in Jurassic Park. As luck would have it, he fulfills some sort of destiny to rein them in in order to hunt down Indominus rex at Hoskins’s insistence. Besides, only Owen can do it well. Hoskins is ready for his field test, Mr. Trevorrow. Image courtesy of Universal Pictures. Once Indominus rex escapes its ill-suited cage, Jurassic World leadership does everything it can to track the dinosaur down, all while keeping its grave breach in security a secret from thousands of visitors. It is worth noting that most of the beast’s victims are people of color, beginning with a Hispanic park ranger and following through to an Asian-American special forces commander and members of his diverse team. In order to protect their expensive “asset,” leadership only allows the group of deadly operatives to pack tranquilizer guns. What’s worse is that they are barely mourned. In the control room, Claire, Owen, Masrani, Hoskins, and others watch each soldier’s computer-represented lifeline go limp, one at a time. This is in stark contrast to Claire’s tearful reaction to witnessing the death of an Apatosaurus, clawed down by the Indominus rex, while on her way with Owen to the northern section of the island to rescue her nephews. This moment obviously recalls the scene in Jurassic Park wherein Dr. Ellie Sattler investigates which plant likely ails the poisoned Triceratops. But again, it rings so false. Apatosaurus, I hardly knew ye! The last third of the movie goes beyond the conventions of a traditional monster movie; it becomes a war picture. Despite Wu’s earlier pronouncement to Masrani, who wonders who signed off on Wu’s creation (it was you, Masrani, duh), that Jurassic World and presumably its 1993 antecedent were “never natural,” Hoskins insists that war is a part of nature, as if his field test is a natural progression of the wars in Afghanistan and against ISIS in Syria. In much the same way that a hungry shark interrupts Samuel L. Jackson’s rousing speech in Deep Blue Sea (Renny Harlin, 1999), a raptor charges at Hoskins, allowing Owen, Claire, and her nephews a way out. Eventually, Gray surmises that the surviving raptors simply don’t have enough teeth to take down Indominus rex, which lends Claire her one opportunity to enact a true, heroic gesture: she orders Lowery to open the T. rex’s compound, which, it must be said, resembles a soundstage on a studio backlot. Still in heels, Claire outruns the King of Dinosaurs on her way back to Owen and the boys. According to Manohla Dargis, “the heels are just silly and a distraction given that they’re nowhere near as insulting as the rest of her.” I’m not a Claire apologist (or, more accurately, a defender of the scriptwriters), but it is undeniable that Claire—and not Owen—bravely leads the T. rex to Indominus rex. The dino battle isn’t particularly noteworthy except for the nostalgia-tinged emotions it elicits in the film audience. Our one-time villain T. rex may die? 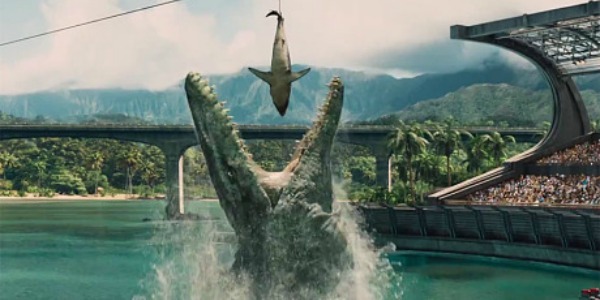 Thankfully, the Mosasaurus emerges from the water, bites Indominus rex, and plunges the dino mutt into its tank. The last shot of the film features the T. rex roaring outside the control room, announcing its return to the top. There will likely be another sequel, because the park leadership still will not have learned its lesson. After all, Dr. Wu got away with the dino DNA. Claire gets her one moment to shine. Image courtesy of Universal Pictures. Before Jurassic World began, I came to a strange but wonderful observation: unlike other franchise reboots of the year (Mad Max: Fury Road and Star Wars included), it’s highly probable that everyone in the packed theater—kids, teens, and adults—had seen the original blockbuster on which Jurassic World is based. The new feature may have expanded the universe of the earlier film, completely loping off its two sequels, but it didn’t use Jurassic Park’s intelligence, sense of humor, or incredible imagination. However, it’s still worth visiting in the same way that one should experience a Disney resort from time to time. What new monstrosity will they cook up next to make you long for the awesome theme park experience of your childhood?